Ant larvae are generally not a hot topic. Most people don’t see them because they are hidden within the ant nest. When noticed, the young ants seem to be legless grubs passively laying around and waiting to be tended by the adult worker ants. Or are they? Let’s take a closer look at ant larvae. whereas others have numerous hairs. Ant larvae are not completely inactive; they are capable of movement. Some species of ant larvae have been shown to sway to attract the attention of passing workers in a behavior that has been described as begging. Other species can even raise themselves off the ground. Take a look at Mark Moffett’s photograph of bulldog ant larvae begging. 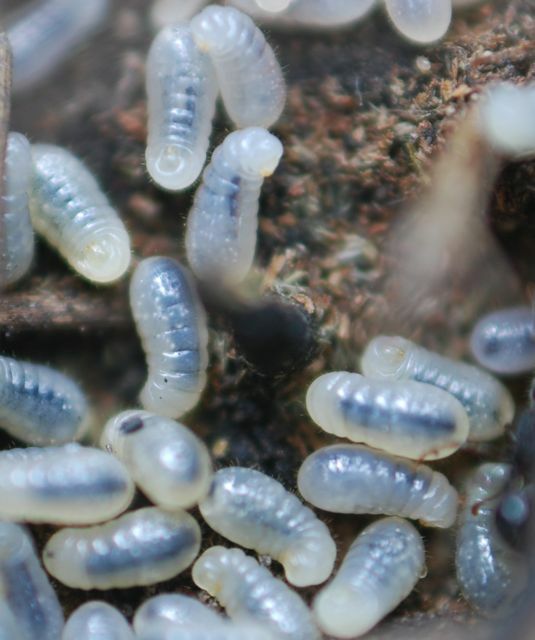 If you disturb an ant colony under a rock, you can observe ant larvae alternately straightening and curling, which looks like they are throwing their heads back. Presumably they are trying to attract the attention of worker ants. This clip is a series of photographs showing ant larvae throwing their heads back. Try to follow the larvae towards the center from slide to slide as they curl and straighten. 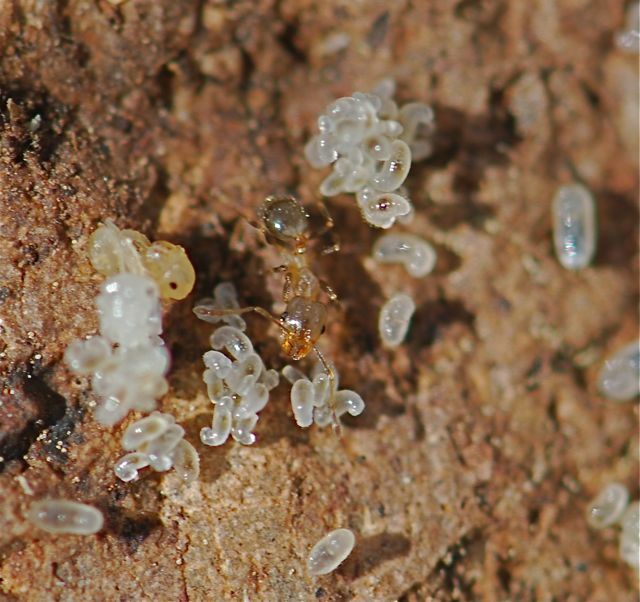 Ant larvae do make active contributions to the colony. The weaver ants, for example, use their larvae to produce the silk needed to tie leaves together to form the nest structure. Probably the most surprising aspect of ant larvae is that not only do worker ants bring them food, but the larvae are often sources of food themselves. Having ultra-thin waists (petioles) makes it impossible for adult ants to move solids into their food-processing centers in the hind section of their bodies (gasters). Adult ants can only consume liquids. Scientists have long known that the worker ants feed all solids to the larvae first for processing. 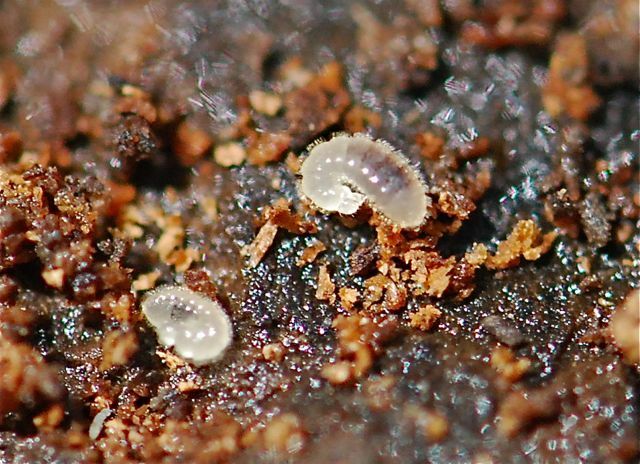 The larvae were thought to chew up, swallow and pre-digest the food, and then regurgitate it back to the workers to distribute throughout the colony. Recently, however, researchers have shown that in one species of bigheaded ants the workers actually place the food on the surface of the belly of the larvae in a special groove (larvae lay on their backs). The larvae spit out enzymes onto the food, basically drooling on themselves. After a few hours, the workers come back and pick up the slime that results, feeding some of it to the larvae and taking some for themselves. According to videos of the larvae processing bits of fruit fly, the larvae very rarely sip any of the gooey liquid while the food is dissolving; they wait patiently until the food is done and let the worker ants feed them. Another odd behavior of this group is that the workers carry the larvae to their food and place them on it, rather than carrying the food to the larvae, as most other ants do. For example, instead of cutting up a caterpillar into chunks and carrying it into the nest to feed the larvae, Dracula ants carry the larvae out to the caterpillar. Once they have fed, the larvae become food themselves. Given the evidence, you can’t help but to conclude that ant larvae are important members of the ant colony and not just passive babies waiting to become workers. Young Ants in the Kitchen -Science News for Kids Summary based on D. L. Cassill, J. Butler, S. B. Vinson and D. E. Wheeler (2005). Cooperation during prey digestion between workers and larvae in the ant, Pheidole spadonia. Insectes Sociaux Volume 52, Number 4: 339-343. Now I want to go poke around in ant nests and watch larvae myself. Thanks for the great explanations of the role they play in the colony — fascinating. And thank you for your very humorous advice for increasing blog traffic. I have a giant crab spider photo on my growing with science blog that gets a least one hit per day. I find larva that looks like this in my barn. It occurs on the cement floor and on the horizontal studs five feet up. Feels kind of waxy. Thousands of them. Could this be ant larva? Having grown up on a farm, I suspect you might have another kind of insect larva. 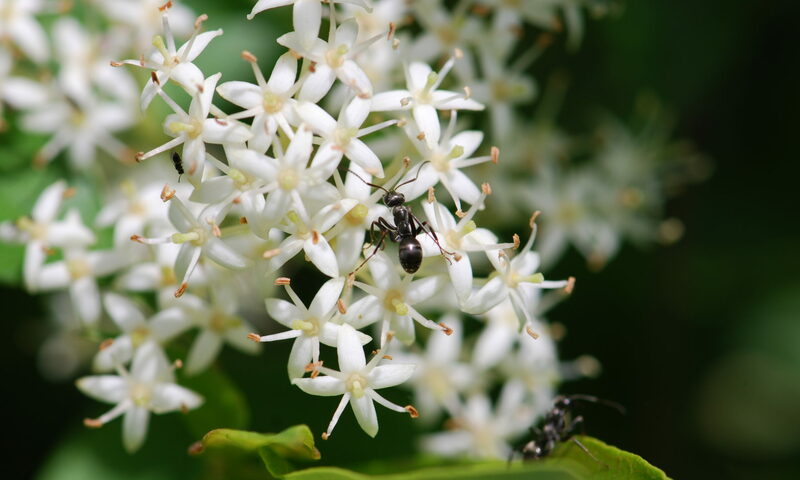 Ant larvae are usually hidden away by worker ants and you only see them if you break open their nest in wood or turn over a rock. You don’t see them out and about. Most likely you have either fly larvae, or a predator or parasite of fly larvae. Is there any way you can post a photograph somewhere and send a link? The fly larvae will also lack legs, but won’t have heads like these ant larvae do. If I understand your question correctly, you want to know if unmated ant queens can lay eggs. Yes, unmated ant queens (under the right conditions) will lay unfertilized eggs that become males rather than worker ants. Hi, it seems your link to Mark Moffett’s photos is outdated. I found a gallery from the site you linked to, but I’m not sure which photo you were referring to. Did you mean this photo ( http://entomology.si.edu/ants-exhibit/photogallery/communA.htm ) when you wrote this article? Thank you for taking the time to let me know. That is the photograph. I will update the link. i have a plastic container on my deck that i keep the chair cushions in. I went to grab a cushion out and saw what i felt was maggots on the cushions. I was surprised to see that there was no source of food in this container but there were a lot of ants. should i guess that these were ant larva and if so isn’t it unusual that they would be without a source of food? why were they there? The container must have had an opening that you weren’t able to detect. The ants will forage for food over a quite a distance and bring it back to the larvae in the nest.